Chocolate Chip Peanut Butter Balls. Pick-me-up dessert in 12 minutes. Do you have 12 minutes today? Yes? Okay go sneak into the kitchen and make this real quick. I came across five different recipes of peanut butter balls yesterday and instead of choosing just one, I combined a couple to make one that suited my taste. Few tips. Peanut butter balls owe their crunch to rice crispies. Don't like the crisp? Substitute quick cooking oats for a chewier consistency. I recommend having both, and adding more of whatever you like best. 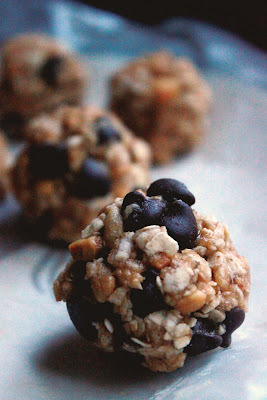 I made mine with more oatmeal and tons of chocolate chips-YUM. 1. Mix peanut butter, honey, vanilla, rice crispies, oatmeal and chocolate chips in a bowl. 2. Scoop with spoon and form into balls. Tip: If the mixture is too sticky that making balls is hard, sprinkle with water. Another tip: make sure your hands are moist when you roll 'em. Five ingredients, 12 minutes to make, perfect quick fix dessert. GO. peanut butter balls, so easy even i can dot it! easy no bake snack for kids!